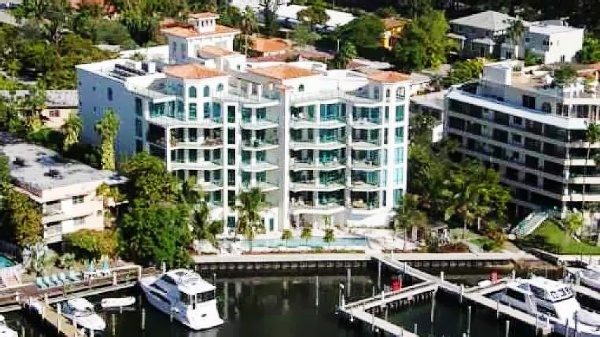 The five story Beacon Harbour condo in Coconut Grove is located near the northeastern side of the neighborhood overlooking the waters of Biscayne Bay to the east as well as the small Grove Isle. It features just ten Coconut Grove condos for sale available with three and four bedroom and up to 3,812 square feet of living area and only two of them on each floor. Penthouses are also available. If you consider yourself a seafarer, you'll find the Beacon Harbour condo's boat slips at the deepwater marina a very convenient feature and a great complement to its other amenities like the modern fitness center, a swimming pool by the bay and jacuzzi. Rooftop terraces in penthouses and the wraparound terraces in the standard units are just a few of the many residential features you'll find within the Beacon Harbour condominium. Vizcaya Museum and Gardens is within walking distance from Beacon Harbour, home to a classic villa once owned by industrialist John Deering. Right across the street from Vizcaya is the Miami Museum of Science. Beacon Harbour is also near CocoWalk which has great shopping and dining or you can visit the city of Miami and classic Coral Gables, the latter being the home of the equally historic Biltmore Hotel and the lush Fairchild Tropical Gardens.